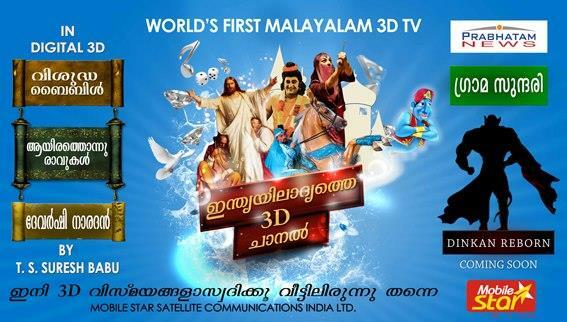 Prabhatam News TV malayalam channel touted as India's first 3D channel will be launched in May 2013. Widening the number of entertainment channels in malayalam, Prabhatam News channel will deliver the latest news along with movies debate, comedy shorts, music, game shows, reality shows, criticism, travel, automobiles, health and much more. So get ready for the ultimate fun with Prabhatam News channel. Can anyone tell the number of malayalam channels currently available at your finger tip? With channels like Asianet, Surya TV, Mazhavil Manorama, Jeevan and Amrita donning the entertainment arena, news channels like Manorama News, Asianet News, People, Mathurbhoomi News and Media One are on the forefront delivering the latest news and information around the globe. Adding one more to the line of channels, now it is the turn of Prabhatam News TV, India's first 3D channel to entertain the television viewers. Prabhatam News TV will give a unique experience to the family audience to get in touch with the latest news movies, debate, comedy shorts, music, game shows, reality shows, criticism, travel, automobiles, health and much more. Expecting to create new waves in TV broadcasting, Prabhatam News would provide quality programmes which would match according to the need of the viewers. The channel will operate 24 hours hours ensuring the best shows day to night. Keeping an eye on the global Malayalees, the channel is to provide impartial reportage and would stand for the rights of the underprivileged and the marginalised. With a strong team behind the venture, the channel will provide credible news at fast time. Being a 3D channel, viewers can enjoy the ultimate enjoyment using 3D glasses. The highlight of the channel would be the number of cartoons which could enthrall the young audience. Stories from the Holy Bible, One Thousand and One Nights, Dinkan Reborn, Devarshi Naradha are some of the show which are exclusively for the young generation. It is expected that other popular cartoon characters like Tintu Mon, Mayavi, Shikari Shambu are expected to get featured in the channel. So gear up to get the ultimate fun with Prabhatam News channel which will have 2D and 3D programmes.